I have realized it’s been quite some time since I wrote a proper National Novel Writing Month post. 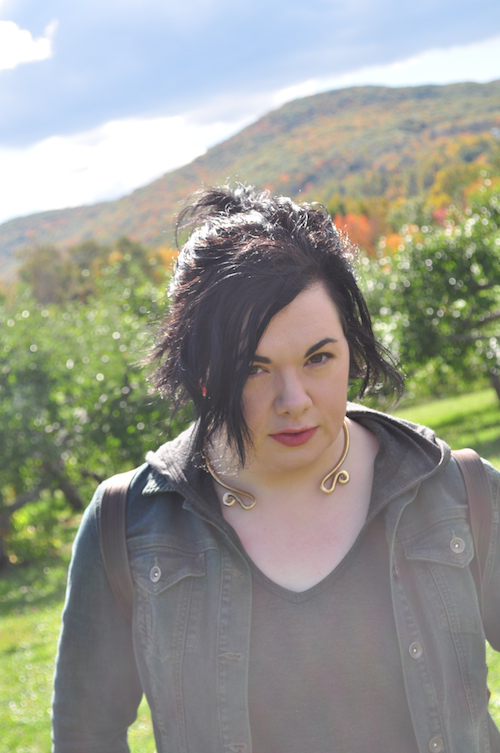 I pseudo-participated the last 2 years and might do the same this year just because I’m trying to finish a draft and I do so love a wordcount graph, but this post is mostly a refresher about NaNo and me and my opinionated opinions. NaNoWriMo is an online-based challenge to write 50,000 words in 30 days. It was started in 1999 by Chris Baty, who is an excellent human being. This is my official NaNoWriMo Pep Talk from 2011. This is a long post from 2010 about NaNo and drafts. It has a lot of bird analogies. This is a much more recent post by my friend Chuck Wendig on why you should and shouldn’t participate in NaNoWriMo. The Night Circus did indeed begin as a NaNoWriMo project. To be specific: The Night Circus began as an unplanned tangent in the middle of a different NaNo project. I got bored & sent my characters to a circus. The circus was much more interesting than anything else that was happening. I then spent an additional two Novembers worth of NaNo time on what eventually turned into 100k+ of long, sprawling, very rough first draft. When I say rough I mean rough. I mean those rocks you use to scrub the dead skin off of your feet rough. I mean it had no plot and Celia wasn’t in it. That NaNoWriMo version of The Night Circus bears little resemblance to the finished book. It was heavily revised and rewritten both before and after it was sold. My NaNoWriMo profile informs me that I’ve been a member for more than 12 years which is making me feel both nauseated and old. I skipped a few years and I can’t tell you which ones because the site doesn’t believe in keeping my entire history anymore, but of those 12 Novembers I’ve probably participated during more of them than not. I didn’t really write much before NaNoWriMo. I thought about writing, which is different than actually writing. (This is one of the great lessons of writing: you have to get the words out of your head and onto paper or screen.) I would write a page and hate it and stop, which is not a good way to get better at anything. I’d write little scraps of things and bury them under self-doubt and insecurity. NaNoWriMo helped me get better. It took awhile, my first several NaNovembers worth of writing are terrible things that will never see the light of day but the later ones have some good bits here and there that could potentially be excavated. You learn a lot writing page after page after page and not having the time to go back and worry over how awful that one particular page was because there are so many more to write. It’s also probably one of the reasons I’m a binge writer and not a write-every-day writer, but that works for me. 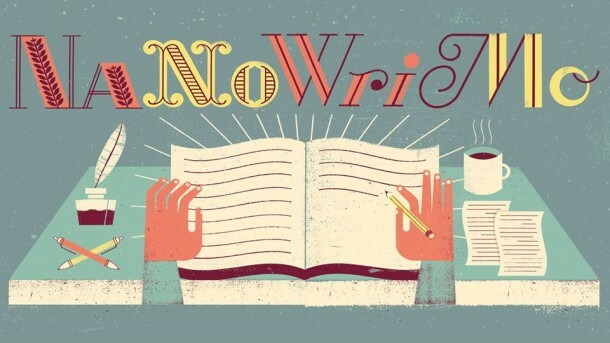 NaNoWriMo is not for everyone. That’s okay. I still maintain that the word “draft” should be involved somewhere. It can be a very helpful first step but there are plenty of other steps. That “the world needs your novel” on the top of the official site that I’m pretty sure wasn’t always there raises my skeptical eyebrow. I’m not sure the world needs your novel but I think maybe you need to write it, if you want to. When I started NaNo-ing back in the dark ages it seemed (to me) much more of a personal challenge and not a means to a publishing-based end. Really I think it’s a writing tool. A crazy, autumnal whirlwind of a writing tool that you can use however works best for your own writing or not use at all. There is no one way to write, after all. To those about to NaNo, I salute you. I wish you electrifying ideas and caffeinated beverages and I hope you discover things before November 30th that you didn’t expect to find on November 1st. 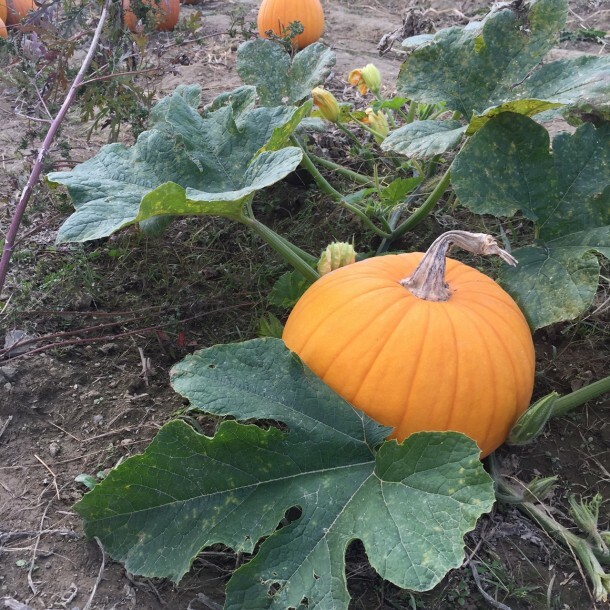 We went apple picking on Friday and did not intend to look for pumpkins but then there was the Most Perfect Pumpkin and it had to come home with us. Not even going to carve it, it is too perfect in its perfect pumpkinyness. I am so glad it is finally fall. September was a lying month filled with 90-degree days but October seems to have its act together. I have socks on. This is better. I keep forgetting to blog because I’m writing and when I’m not writing more typing seems like silliness when I should be resting my fingers, or doing little finger exercises. I’ve been knitting, trying to finish the scarf I started in July (um… July 2014, that is), and I suppose knitting is finger exercise. I read Elizabeth Gilbert’s Big Magic and loved it. I like books on creativity and this one is a fairly quick read but packed with very big ideas. It feels like it took up more space in my brain than it did on the page which is a neat trick. 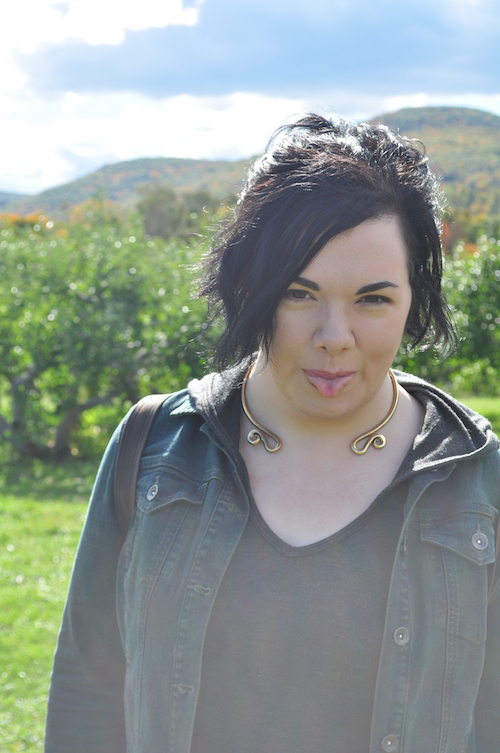 Adam took some lovely photos of me during Friday’s apple picking perfect pumpkin excursion. I do not know what’s going on with my hair. Okay, I do know what’s going on with my hair: I cut it wrong last time I did it (I always cut my own hair) so I’ve been putting it up in shame ponytails when there is not quite enough of it to pony. I am trying to think of what’s new or what’s news and there is no news and not much is new besides pumpkins and pounds upon pounds of apples (I am going to bake an apple crisp of some sort this week). Still writing. Still throwing things out and rewriting. Still trying to figure out where this book is going though it is finally consenting to being almost book-shaped. Almost. But it is a winter book, so it is sorting itself out more now that there is a chill in the air, pulling up a blanket and sitting next to me on the couch and hopefully once I ply it with enough warm beverages it will tell me the rest of its secrets. Still on Twitter hiatus, likely for at least the rest of the year. Still not doing any public appearances until this draft is done. Still obsessed with Dragon Age, still trying to figure everything out, still over-using the word still.